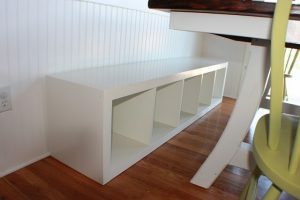 A while back we bought an Ikea Expedit bookshelf, turned it on its side and used it as a bench for our kitchen table. Although it served its purpose, it was definitely lacking. It obviously needed some sort of storage containers (that was part of the point) and some color. Enter fabric. So, I had my very handy hubby cut me a piece of particle board to the exact dimensions of the top of the bench. I then laid it out on top of a piece of 2″ thick foam (from Hobby Lobby). Then I pretty much did the same with my fabric. I just laid out my board and foam, made sure I had enough fabric to staple all sides and cut it. Then I used a staple gun and stapled the fabric as tight as I could to keep it from wrinkling. Easy as pie. I used a laminated fabric that I found on Fabric.com. I figured it was mainly going to be used as a seat for my two girls so it needed to be wipeable. This seemed like the perfect choice. And the colors matched the colors I have going on in the kitchen/family room. Now for storage. I bought three baskets, again from Ikea. I cut a piece of cardboard into small rectangles and painted them with chalkboard paint. Then punched holes and attached them with twine. Perfect labels for things we use at the kitchen table. I used one for place mats. This one was for game pieces. Here is the finished product. I never have a problem finding things to store so I’m sure they will all be filled eventually. Until then, I’m kind of liking the three baskets. Adds a little warmth to the stark white bench and wall. The original idea was to screw the board on from the bottom but it was heavy enough we felt like we didn’t need to–yet. We’ll see. If we experience any grease trap issue, we always trust a professional, reliable and affordable grease trap services. Cute eh? And it’s comfy. The kids actually like to put their pillows on it and use it as a bed. Why not?